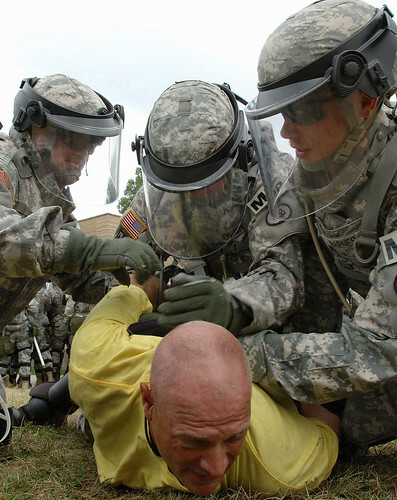 The Senate is set to vote on a bill early this week that would define the whole of the United States as a “battlefield” and allow the U.S. Military to arrest American citizens in their own back yard without charge or trial. “The Senate is going to vote on whether Congress will give this president—and every future president — the power to order the military to pick up and imprison without charge or trial civilians anywhere in the world. The power is so broad that even U.S. citizens could be swept up by the military and the military could be used far from any battlefield, even within the United States itself,” writes Chris Anders of the ACLU Washington Legislative Office. Under the ‘worldwide indefinite detention without charge or trial’ provision of S.1867, the National Defense Authorization Act bill, which is set to be up for a vote on the Senate floor Monday, the legislation will “basically say in law for the first time that the homeland is part of the battlefield,” said Sen. Lindsey Graham (R-S.C.), who supports the bill. Let us not forget, America is undergoing a fundamental transformation into Socialism/Marxism and we need all the help we can get to take back America. Who can protect us during these trying times? It is time for the sworn protectors of liberty, the sheriffs of these United States of America, to walk tall and defend us from all enemies; foreign and domestic. When sheriffs are put in the quandary of choosing between enforcing statutes from vapid politicians or keeping their oaths of office, the path and choice is clear, "I solemnly swear or affirm, that I will protect and defend the Constitution of the United States." Sheriff Richard Mack, nationally acclaimed author, speaker and former Sheriff of Graham County Arizona is on tour through various cities and will speak about how one person can make a difference. In 1994 Sheriff Mack took on the infamous and unconstitutional Brady bill and on June 27th, 1997, the U.S. Supreme Court ruled that the Brady bill was in fact unconstitutional and a violation of the 10th Amendment and threw it out. Come to his conference to understand the goals of Sheriff Mack and other Constitutional Sheriffs. Limited seating, please RSVP for this important event!